Not until I’m already neck deep in the river, pumpkin-sized rock hefted heavy in my arms and feet marching a steady beat forward, do I remember that I haven’t finished my writing assignment. I’m standing in a slow, cold section of the Main Fork of the Salmon River, on the northeastern edge of the Frank Church - River of No Return Wilderness, Idaho. I’m here on a six-day guided river trip and writing workshop, hosted by the Freeflow Institute. Freeflow, an exciting new program dreamt up by Chandra Brown, aims to help established and emerging writers alike "take (their) craft outside." Chandra, former Camas Editor, is the brains and heart behind the organization, and I was fortunate enough to join her, Nick Triolo (another former Camas editor) and Pulitzer prize nominee William DeBuys as they led a group of twelve writers including myself on this inaugural Freeflow trip down the Salmon. This writing workshop is unlike any other writing workshop. The trip is guided, meaning that the rafting and whitewater component of the days are pretty much taken care of. The task set before us then, as writers, was to do just what Chandra designed these courses to facilitate: take our craft outside. We were tasked to focus on listening, looking and leaning in. Each morning we would gather and talk craft with Bill DeBuys. Each day a new topic emerged, around which Bill helped us build a discussion of thoughts and tools. By the time our cups of coffee were drained and the sun was just pulling its way up over the canyon walls, Bill would give us a writing assignment for the day to ponder. First cup of coffee done. Shade shrinking, sun cresting the beach. Break for breakfast. So our days went. Gather, listen, share, eat ridiculously amazing food prepared by our welcoming and enthusiastic guides, then get on the water. Go down the river. Our days found a rhythm. I’ve rafted quite a few rivers in my life and hiked a lot of trails, so this rhythm of quiet and movement through wild space is familiar to me. But the guided aspect of this trip, combined with community and attention towards writing was something new entirely. The fact that I was not in charge of steering the boat safely through rapids, making meals, or breaking down camp at first honestly just gave me anxiety. I didn’t know what to do with my hands. But gradually, after repeated reminders, I started the process of what Chandra reminded us on day one. This week on the Salmon offered a unique chance to be free of distractions, deeply for once, and to focus, really focus, on writing. This chance was a gift. Each day, I leaned a little further into the rhythm. Once on the water, we would navigate whitewater and explore old historical sites. I tried often to stop and notice, stop and write, reflect. I, like many writers, struggle most in writing with those moments before I actually begin. Beginning is the hardest. Those first few days I pushed against the slowing down. Wake up, listen, talk about writing, get on the river, go down the river, pay attention, fiercely. Take notes. Write down as much as you can. Later, early evening, we would arrive at camp and gather again. Over cocktails, we discussed the day, shared our words. So it was that each day was a new beach, a new lesson, a new stretch of river. This morning, halfway through the trip, our writing assignment had been to write two different paragraphs, each focusing on finding the telling detail of a place. We were instructed to look for the voice of a place, and do our best to capture it. We had plenty to work with. The Main Fork of the Salmon, classified as a Wild and Scenic River in 1968, has a long history as a peopled place. Several Native American tribes, such as the Karuk, Shastans and Konomihu, have a long history of settlement and migration along the banks of the Salmon. In the early 1800’s, European fur trappers started frequenting the river canyon, followed quickly by an influx of prospectors, miners and eventually homesteaders. The river now winds through what is technically the heart of wilderness, yet its banks still function as home and livelihood to many. The Salmon, then, offers profound juxtaposition. The Frank Church, at over 2,000,000 acres, is the largest contiguous wilderness in the lower 48. Yet all along the Main Fork, power boats that were grandfathered in rifle the waters. The banks swing from steep, rugged canyon walls and open sandy pristine beach to functioning ranches, old homesteads and tourist attractions. The Main Fork of the Salmon feels at once remote and occupied. Today, we stopped at Buckskin Bill’s, a classic on this river. We also pulled over to soak in the magic of confluence where the waters of the Middle Fork flow into the Main. Further downstream, we stopped finally at Rabbit Camp, home for the night. Rabbit Camp is a wide, white exposed stretch of sand snugged up against high cliff walls. There is so much to notice here, to breathe in, to catch and spin into stories. Yet today was hot, low 90’s perhaps. Not terrible, true, but more sun than this northerner is adapted to. Chandra, at the beginning of the trip, reminded us that here, this week, we should do our best to take advantage of our time. Use this time, she told us, to lean in. Use this time to focus on your writing. Which brings me back to the river, where I’m standing now, holding a rock. Chandra was right, about this place being perfect to focus on writing. But when we arrived at camp today the heat was nagging. We’d been in the sun all day, and I was wilting like a tomato plant too long unwatered. Writing. Right. Finish your paragraphs. My brain was moving sluggishly, when Nate suddenly hollered from the shore. Nate is a veteran raft guide who knows a thing or two about rivers. My brain clicked on. Intrigue. Water. Cool down please. So, the Rock Game. Have you heard of it? You find a rock, big enough to weigh you down. Then you find a calm stretch of water and some friends who are equal parts goofy and ready for a swim. Then together, rocks in arms, you all walk straight into the river, perpendicular to the current, as far as you each can go. Feel the sand, the tiny mountains of earth that the waves have made under the arches of your feet. Feel the cold, the shock of the water, as it creeps up, as you walk down. It reaches your knees, now your waist, now your stomach, now your chest. The cold is sharp, both jarring and delicious. You keep walking. Now it reaches your shoulders, then your neck, now your chin. One last deep breath in. And you keep walking. The river is up above your nose now, your eyes, now up over the top your head. A few steps more. A few more steps. The rock feels heavy, oddly comforting, as you shuffle along below the surface. A gift, this ability to defy buoyancy. You are changing perspective. Then, quickly, quicker than you thought, it’s over. Time to retreat. Your air’s used up and with it, this brief glimpse into another world. Drop the rock, push to the surface, off the sandy bottom, up, up… up. I break the surface of the river to a torrent of shouts and calls and laughter. Heads and shoulders dot the water around me, various distances from shore, and everyone is cooler now, and new. We shoulder our way back to the beach, leaving a tattoo of our time there and our antics on the river floor. I never did finish my writing assignment that day. I’m realizing, like perhaps every writer ever, I will always struggle with distractions. But that day I shared what I did have. And the gift to be there, the gift to explore and listen and reorient our lives to this rhythm and flow of words was invaluable. This week on the Salmon for me was about writing, yes, but it was also a reminder of perspective. It was a reminder of the importance of committing to craft, and leaning in. This was Freeflow’s first year at it, and they did a mighty fine job. 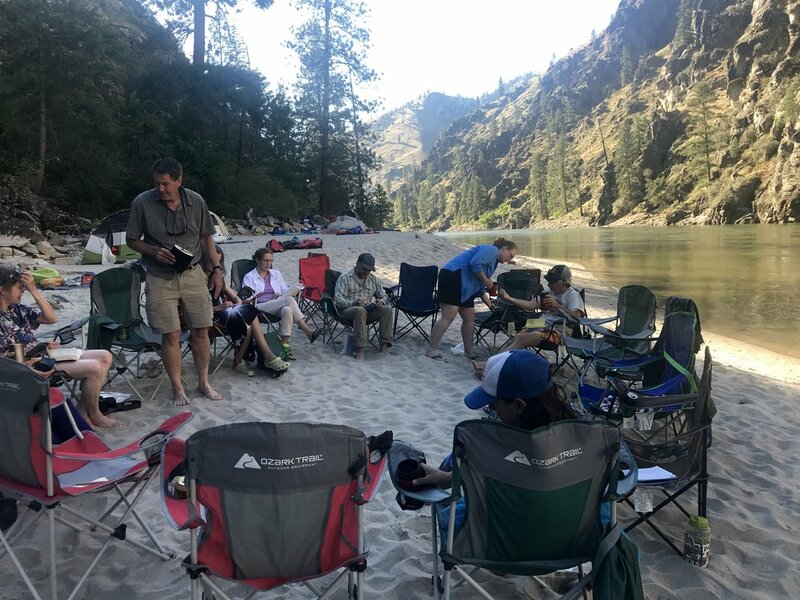 So if you’re around next summer and want to get some college credit, or just want to spend a week on the river with writers, I suggest checking them out. It’s true, that I never did finish that second paragraph. But it seemed like Bill forgave me. I bet he’d forgive you too, if it was a hot day and the river was calling.